Welcome to Mole Removal San Diego! 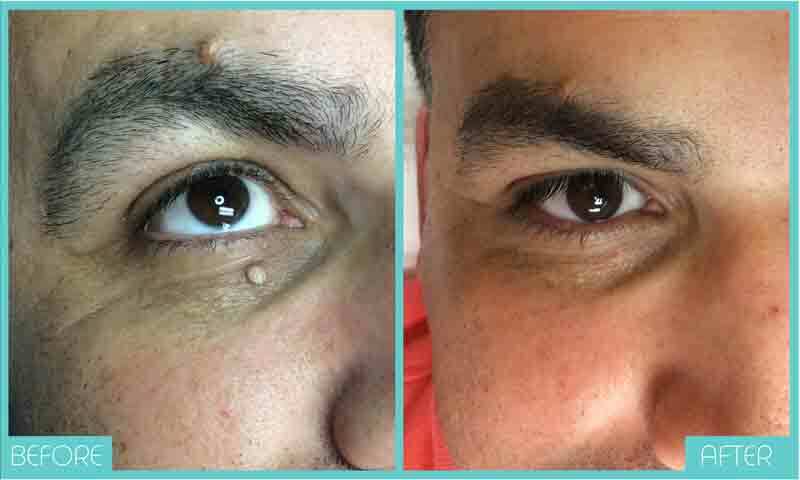 Safe & Noninvasive Skin Tag & Mole Removal Surgery. Book Your Appointment Today! We all look at ourselves in the mirror. For those of us who have moles, scars, or skin tags, they can often be a source of discomfort and dissatisfaction. Usually the result of excessive UV ray exposure, aging, injury, or hormones, it is important that you and your doctor examine your growths to determine the extent of damage to your skin and if preventative treatments are necessary. Fortunately, you can visit Mole Removal San Diego and get your skin looking clear again. We offer services for removing common skin growths like warts, moles, scars, and tags. Let us remove your moles and other skin growths and get you feeling confident again. The number one goal that we have at Mole Removal San Diego is to treat your skin as effectively as possible in a comfortable and safe environment. All the removal treatments that we have for moles, scars, and skin tags are designed to be as minimally-invasive as possible. When it comes to removing scars, we will customize the treatment to accommodate your unique skin type, skin flaw size, and the appearance of the tissue. That way, we can lighten your scar as much as possible and perhaps even eliminate it entirely. Since all scars are different, the end result will depend on the specific attributes of your particular scar. At Mole Removal San Diego, the health of your skin is our passion, every moment of every day! We are here to help with the removal of your unsightly moles, skin tags, warts, and other unsightly skin growths! Thank you for choosing Mole Removal San Diego! As for warts and tags on the skin, we have various methods for removing them. We can use cryosurgery technology to ablate the damaged tissue or we can use traditional surgical tools to excise them. When it comes to moles, you don’t have to rely on a standard surgery. There are new surgical methods for removing moles, including laser surgery, electrosurgery, and Radiosurgical Technology. No matter which removal procedure is performed, you will certainly see a positive difference afterward. Mole Removal San Diego employs some of the newest and most advanced techniques for removing moles, lightening scars, removing a lipoma, and removing practically any other type of skin growth. If you notice a strange bump or mole on your skin and you want to get rid of it, contact us today to make an appointment with our specialist physician, Dr. Peter Mann. No matter what type of skin you have, chances are that you have a mole somewhere on your body. Fair skinned adults are the most likely to have moles on them. There is no telling where on the body that moles will form. Sometimes, moles will just appear flat on the skin while other times they will be a little bumpy. Moles also have different colors to them too. They could be colorless, tan, black, brown, or the same tone as your skin. In most cases, a mole on your skin does not indicate a serious condition. However, just to be safe, you should have any new, changing, or uncomfortable growths examined by a doctor. If skin cancer runs in your family, then you want to be extra cautious if you have new, changing, or uncomfortable growth. If your mole is not cancerous and is not causing you any health problems, should you still remove it? Most people would say “yes” because their mole causes them discomfort or embarrassment. Non-cancerous moles can also be annoying because they rub against the fabric of your clothes or itch on occasion. If you irritate a growth, it could bleed or leak other fluid. Skin tags are small, narrow, and unattractive skin growths which normally form on people who are over 50 years old. They’re technically tumors, although not cancerous ones. This means that skin tags don’t pose a threat to your physical health. However, they may not be so great for your mental health if you hate how they look on your skin. There are certain areas of the body where the skin folds and creases. These are the areas which are most susceptible to getting skin tags. Your armpits, neck, eyelids, breasts, thighs, and groin are the main areas where skin tags form. Sometimes the growths have the same color as your skin while other times they are darker. Whatever you do, don’t try to pick or pull your skin tags because that will just irritate them more. In fact, skin tag irritation can occur if the tags rub up against your clothes for too long. Although skin tags don’t threaten your life, you’ll probably want to get rid of them anyway to eliminate all this annoyance. There are several options available for professionally getting rid of them, such as surgery, cryotherapy, electrosurgery, and ligation. So, which treatment is the best for you? That is really up to your doctor. The severity of your skin tags and your current health are the main deciding factors of which treatment you’ll get. Surgery is the easiest and less complicated treatment because the dermatologist simply uses surgical scissors to cut off the skin tag. Alternatively, electrosurgery uses high-frequency electricity on the skin tag to burn it off. And finally, ligation is where the doctor restricts blood flow to the skin tag by tying it off with surgical thread. Each one of these treatments is special and unique. The doctor at Mole Removal San Diego will go over each one of them with you first. Glad I found Dr. Mann. Had a mole removed using a radiotherapy treatment. Scarring was minimal and it healed faster than the mole shave I had a few years ago. I have had moles behind my temple for as long as I can remember - haircuts have always been a pain!! I am happy to say that Dr. Mann was able to remove them quickly. I'm very impressed with the procedure I had done at Dr. Mann's office. He and his staff were very attentive throughout the process, from check in to check out. I had one mole removed above my lip and it's healed wonderfully.